SocialAdr is an interesting link building service that has a focus on social bookmarking. SocialAdr has been gaining an interesting and mixed reputation amongst SEO specialists for a while now. 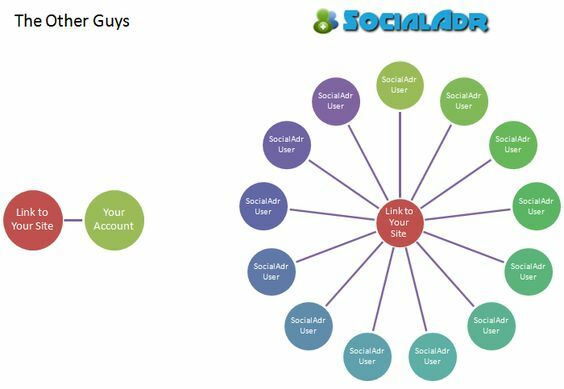 I have found that SocialAdr tends to get mixed results, with most link building services providing only low quality backlinks. My findings have proven that SocialAdr can be effectively used despite low quality backlinks usually being detrimental to a website. Now I look at SocialAdr as a support for your existing backlinks. Not all of the backlinks you set up will be successful or beneficial for your website. You can check their effectiveness with several online tools such as SEMrush and Link Explorer by Moz. Specialists often use these tools to rate the quality of their websites, but forget they can be used to scout their backlinks. Why should we scout our Backlinks!?! It’s important to look at all of the backlinks you set up going to your website because their value can have an effect on your site’s overall value. If you have under performing backlinks you have two options: You can sever the backlink or you can try and raise it’s value. I always prefer to try and increase the value of a backlink, rather than abandoning work, and an automatic backlinking or social indexing service can be hugely beneficial! If your backlink has a non existent value, then even a little attention from a social indexing system or automatic backlink builder can benefit it. Too many links back to it will be regarded as spam, however a few here and there will give your backlink value. If the backlinks have higher value, this will increase your site’s value. Backlinks and Social Bookmarking software like SocialAdr can be useful if you are building a directory. I find that directories are often penalised by search engines like Google and Yahoo. Directories have a lot of information linked to different companies, keywords and suchlike, thusly they can find it a struggle surviving. The problem is that they don’t have a lot of direct information about any particular topic. SocialAdr and other backlinking software like Socialmonkee can be invaluable to give pages that little bit of support. Having a tonne of backlinks going to your home page will make it seem spammy and the crawlers won’t like it. If you instead have a few backlinks going to each individual company or page, you can increase the value of a directory and start to rank. Once you’re ranking and on the way, I’d advise laying off the backlinking and focusing on natural growth. Getting customer’s websites to link back to you will help more than any social bookmarking or backlinking tool. Backlinking in this way is just a great temporary measure to get your directory some power. I would also not recommend it for any other form of website. How do I get SocialAdr? You can get hold of SocialAdr by clicking: here! Once you sign up on the website you have two options. The first, which is the easiest and most cost effective if you value your time is to pay to use. This isn’t necessarily a great idea if you don’t have a lot of money to spend. When you are in the setup wizard, you’ll get the chance to save time. The SocialAdr team gives you the option to purchase all the useful accounts and get them set up for you for $11.00. I prefer to set up my accounts individually so I can link them back to my websites where possible! It’s also good knowing what each platform does and how it does it! For all the benefits of SocialAdr, you definitely don’t want to add your Twitter or your Facebook to the system. The main issue is that SocialAdr has access to all of your linked accounts and can post to them at will. While you are in direct control of what is posted, the way the posts go out is for the most part unsightly. If seen on a business account it will look very unprofessional. The free version is good because it allows you the ability to get some links out there for free on multiple social media platforms. Just be careful when it comes to your actual business account. What Networks can I sign up on my SocialAdr Account? SocialAdr is capable of out to these networks: Twitter, Facebook, Pintrest, Diigo, Ello, Plurk, Gab.ai, APSense, TheTopLink, Bitly, Flipboard, RateItAll, WeHeartIt, SiteJot, Folkd, ItsMyUrls, Instapaper, Papaly and a few others. As I previously mentioned it’s best not to link SocialAdr to your professional Twitter and Facebook. Also if you run a Pintrest professionally I’d advise making a new account just for SocialAdr. You will always want to be in control of everything you post to these accounts. There are terrible repercussions if you accidentally post something your audience isn’t interested in. SocialAdr’s process is fully automated so accidents can be troublesome to reverse engineer. Finally your business accounts are primarily for business, and you have to be careful what you post on them. You need to keep an audience engaged, not alienated. Your personal accounts are for your friends, and you don’t want to drive them away! So all of this sounds slightly risky on the surface. Is SocialAdr the right platform for you and is it useful? The answer is: SocialAdr is risk free in regards to your personal accounts. There will only be a problem is if you choose to connect your personal and business accounts to the platform. If you make entirely new accounts to connect to it, SocialAdr functions brilliantly with no issues. Just make sure you use it to link to backlinks you can only benefit from it. SocialAdr has helped me rank videos and help boost the power of directories. I have not seen a significant boost directly linking to your personal websites. Having used SocialAdr for a very long while now, my team has discovered that it’s brilliant for giving your backlinks a little extra power, and personally find it well worth setting up.